Customer Engagement experiences within Travel vary depending on the company. But, booking abandonment is an issue for all online travel websites. Many companies experience drop out rates as high as 90% – far higher than figures for other industries. 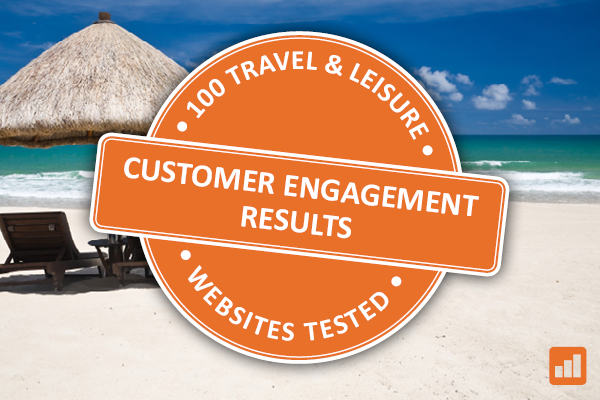 To find out more about the issue, Optilead conducted customer engagement tests on 100 top travel and leisure websites to see how well the industry is coping with these high numbers of abandoned bookings. The buying process was left incomplete three times on each site, to see how well they re-engage with customers who are looking at their deals. Only 16 of the companies we tested made any attempt at all to re-engage with these abandoned bookings, which were worth, on average, over £2,153. The majority of these responses (14) were simple automated emails that were not followed up. It seems that although businesses may be aware that people leave their website, they are currently not doing anything to encourage them to return. One site even failed to provide any sort of follow up for a booking worth £12,576.12, despite having all of the customer’s details readily available. Looking at the companies that did respond, it is clear the current systems do not react fast enough to a shopper that has left their website. The average response time across all channels was 11 hours and 35 minutes after the booking was abandoned. Studies suggest (source: Lead Response Management) the most successful remarketing efforts are made within the first hour of a customer leaving a website, in order to catch them when they are sat down and ready to buy. Just one company out of the 100 that we tested managed send an email which was delivered 20 minutes after abandonment. Where possible, a telephone number was left with every abandoned booking in our testing, but only 5 companies picked up the phone to talk things through. Phone leads are almost ten times more likely to convert than any other method, as it gives sales teams an opportunity to resolve objections the customer may have had online. So it is surprising companies haven’t been using this channel more. This was actually quite surprising. Before carrying out the testing we had assumed that many of the larger companies would have automatic systems in place deal with abandoned orders through the relevant channels. In reality, only one of the top 5 websites for monthly visits launched any sort of response. The websites that performed the best in this area were those with fewer than 500k monthly visits. These companies accounted for 64% of our respondents – a far higher proportion than websites with medium traffic (8%) or high levels of traffic (28%). Even though buzzwords like ‘omnichannel’ and ‘multichannel’ are branded about by thought-leaders on a regular basis, it seems most travel companies are failing to keep up. Just one website employed a multi-channel approach to their remarketing efforts; sending an email, followed by a call, followed by a secondary email. Retargeting customers through a number of channels gives companies a greater chance of contacting customers and bringing them back to complete their order. “Huge numbers of customers are currently looking for their dream holiday online, but they are not getting the help they need,” says Richard Gomersall, Customer Engagement Specialist at Optilead. “High rates of abandonment are often put down to high booking values, or people just taking a look at prices. But as sellers, what we should be looking at is what we can do to take this opportunity and help customers complete bookings when they show an interest,” he added. Inevitably, the companies that find the best mix of phone, email, SMS and other communications will get the best customer engagement results. Survey Results: How do Airport Parking companies respond to online Booking Abandonment?